Comment: JourneyEast is a China oriented website designed and maintained by a good friend of mine, a talented professional web designer in San Francisco. I revisited her site recently and noticed an excellent article worth recommending. Apparently China had its own counterpart to Oskar Schindler, John Rabe, and Minnie Vautrin. He was Ho Fengshan, the Republic of China Consul General to Vienna, Austria. 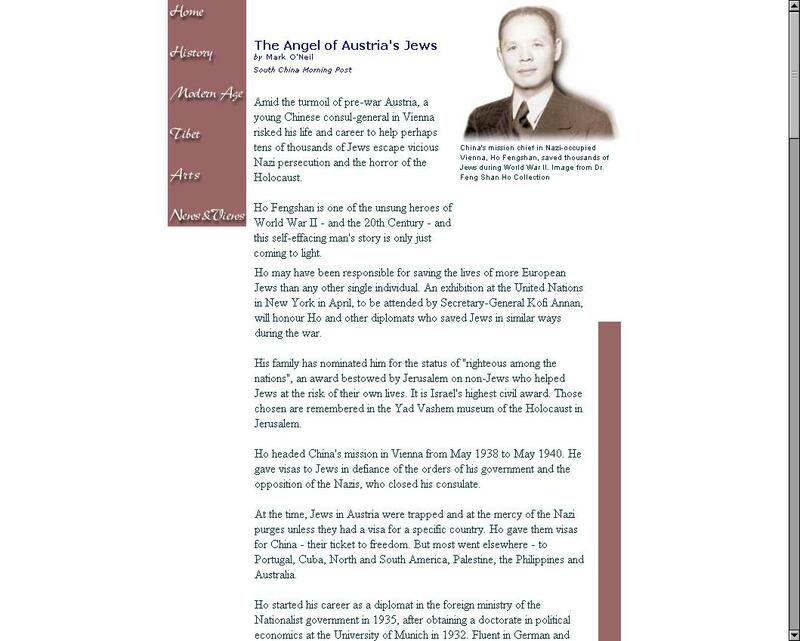 Ho saved the lives of thousands, perhaps tens of thousands of Austrian Jews just prior to WWII. June 7, 2007, is the 70th anniversary of the June 7, 1937 Marco Polo Bridge Incident. The Seven Seven Incident, as it is also known, was a fierce battle between the defending Chinese National Revolutionary Army and the invading Japanese Imperial Army that marked the beginning of the Second Sino-Japanese War (1937-1945). That makes today as good a day as any to read about an unsung Chinese hero of WWII.